Though combating terrorism finds mention in the joint declaration issued following the conclusion of the Bimstec Summit in Kathmandu, the fact of the matter is that connectivity, trade, people-to-people ties and cultural linkages are the larger priorities of the seven-nation regional bloc that is now growing in prominence. If one highlights the counter-terrorism part of the Kathmandu Declaration issued on Friday after the Fourth Bay of Bengal Initiative for Multi-Sectoral Technical and Economic Cooperation (Bimstec) Summit, Pakistan willy-nilly becomes the elephant in the room, defeating the very purpose of the bloc's existence. 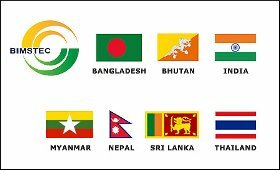 Bimstec, which came into existence in 1997, comprises seven countries lying in the littoral and adjacent areas of the Bay of Bengal -- Bangladesh, Bhutan, India, Myanmar, Nepal, Sri Lanka and Thailand. The bloc brings together 1.6 billion people, or 22 per cent of the world's population, and has a combined GDP of $2.8 trillion. Membership in the bloc allows India to engage more with the extended neighbourhood in Southeast Asia under New Delhi's Neighbourhood Policy via northeastern India. With the South Asian Association for Regional Cooperation (Saarc) virtually rendered ineffective as a bloc, largely due to non-cooperation on the part of Pakistan on issues like connectivity and counter-terrorism, India has been giving more importance to Bimstec in recent times. After the cross-border terror attack from Pakistan on an army base at Uri in Jammu and Kashmir in September 2016, that year's Saarc Summit scheduled to be held in Islamabad stood cancelled after other members of the group joined India in boycotting it. Though Bimstec has been in existence for over two decades now, the Kathmandu summit was only the fourth one, the earlier ones being in 2004, 2008 and 2014, but expectations are that the group's leaders will meet more regularly. As Preeti Saran, Secretary (East) in the External Affairs Ministry, told the media here, Bimstec, which has its secretariat in Dhaka, is yet to have its own charter, but the member-countries are consolidating the group's rules and procedures. "Clearly the secretariat will assist the Bimstec member-countries to draw its rules and procedures and consolidate itself internally and, as it does that, I am sure there will be this desire on the part of the member-countries to meet more frequently and I am hopeful that at some stage it will become an annual event," Saran said in response to a question by IANS. After the 2014 summit, India organised the Bimstec Outreach Summit in Goa on the sidelines of the BRICS Summit in 2016 and then came the Kathmandu Summit. That connectivity, trade and people-to-people ties are the priorities for India in its interaction with Bimstec is amply reflected in Prime Minister Narendra Modi's speech at the plenary session of the Kathamndu Summit where the word "terrorism" finds mention only twice towards the end, whereas "connectivity" is mentioned no less than nine times. Emphasising that the Bimstec member-states have to work together to achieve peace, prosperity and happiness in today's interconnected world, Modi said: "I believe that the biggest opportunity is connectivity -- trade connectivity, economic connectivity, transport connectivity, digital connectivity, and people-to-people connectivity." India's membership of Bimstec also complements its increasing engagements with the Association of Southeast Asian Nations (Asean) regional bloc under New Delhi's Act East Policy. "It is no surprise that the culmination of both India's Neighborhood First and Act East happens in this region of the Bay of Bengal," Modi said. Under the Act East Policy, two key connectivity projects are coming up -- the India-Myanmar-Thailand trilateral highway connecting Moreh in Manipur with Mae Sot in Thailand, and the Kaladan multi-modal transport project connecting Sittwe port in Myanmar with Mizoram. However, it is not the physical infrastructure alone that will suffice for connectivity between South Asia and Southeast Asia but it is the "soft connectivity" that will be the key as Thai Ambassador to India Chutintorn Gongsakdi put it. "What is more important is that when the road (trilateral highway) is finished, we have to be prepared on the customs, immigration and quarantine aspects because we cannot have roads and then people getting stuck at the border," Gongsakdi had told IANS in an interview. The Kathmandu Declaration also reiterated the Bimstec member-states' resolve to conclude the Bimstec Coastal Shipping Agreement and the Bimstec Motor Vehicle Agreement. In terms of trade, it renewed the group's commitment to an early conclusion of negotiations for a Bimstec Free Trade Area. This comes even as negotiations are on for a Regional Comprehensive Economic Partnership, a free trade agreement between the 10-nation Asean regional bloc and and the six countries with which its has existing free trade agreements -- Australia, China, India, Japan, South Korea and New Zealand. In terms of people-to-people and cultural linkages, India has been touting its Buddhist heritage that has connected South Asia and Southeast Asia and the Kathmandu Declaration committed to establishing a Buddhist Circuit in the region. India also offers a number of scholarships to Bimstec member-states under the Indian Technical and Economic Cooperation and Indian Council for Cultural Relations for education and training purposes. Inevitably, condemning and combating terrorism will always figure in any bilateral or multilateral document India is party to, but when it comes to Bimstec, things have to be seen from a different perspective.